Good morning! Good night! 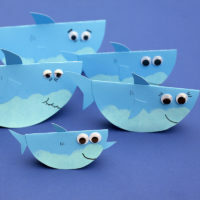 This craft says it all, and is made with materials you probably already have at home! 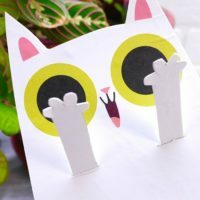 It’s really fun to put together with lots of stamps and painting, and when you are done, it’s a lovely interactive art piece for your wall. 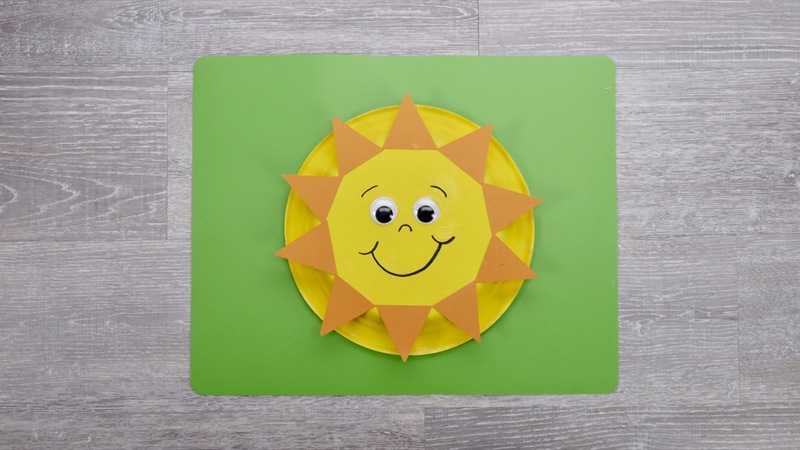 Try hanging the finished craft in your child’s bedroom, and have them turn it over to say good morning to the sun, or good night to the moon. 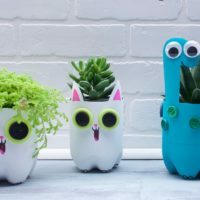 It may even become an exciting part of your bedtime and wake-up routine! Whether it’s time to rise and shine, or close your eyes, this craft has got you covered. 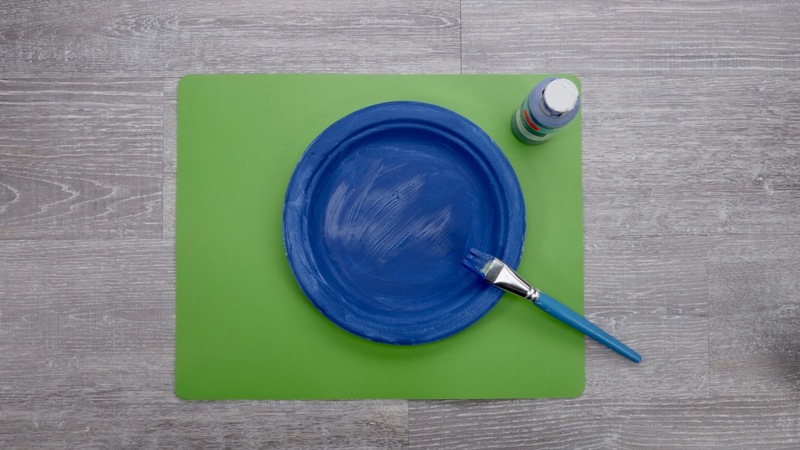 Paint the top side of the paper plate blue (the side you would eat off of) Squeeze paint on the plate and spread with a brush. Leave to dry. Paint the bottom of the plate yellow, and leave to dry. To make the craters on your moon, dip a bottle cap in yellow paint and stamp it on the crescent shape. You can use both the top and bottom side of the cap, and a pencil eraser tip works well for the small craters. Once dry, cut out your moon shape. 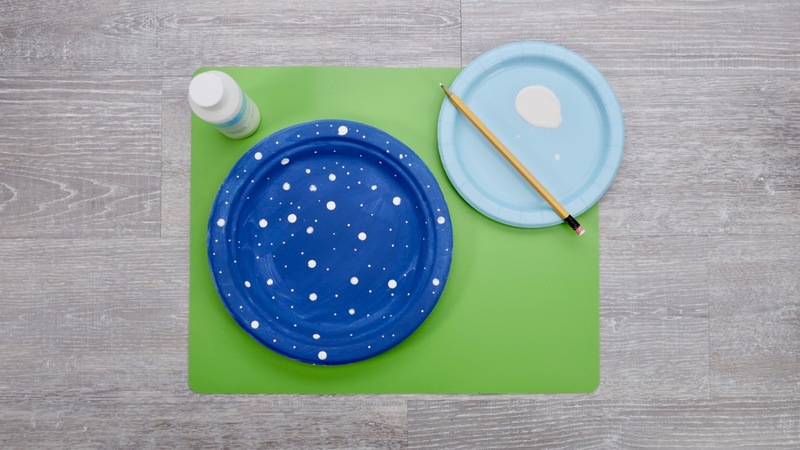 Paint the stars on the blue side of the plate – dip both ends of a pencil into white paint and dot the plate to add as many stars as you like. Leave to dry. 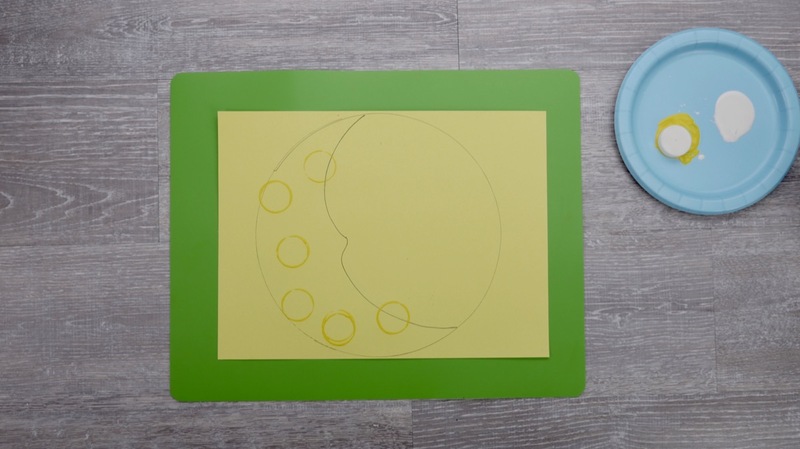 Draw a closed sleeping eye and a mouth on your moon. 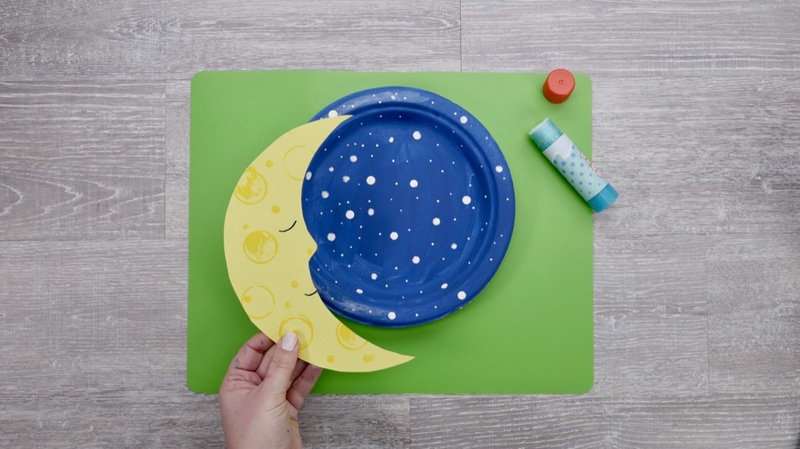 Glue the crescent moon to the edge of the blue side of the plate. Turn over to the yellow side, sunny side up! 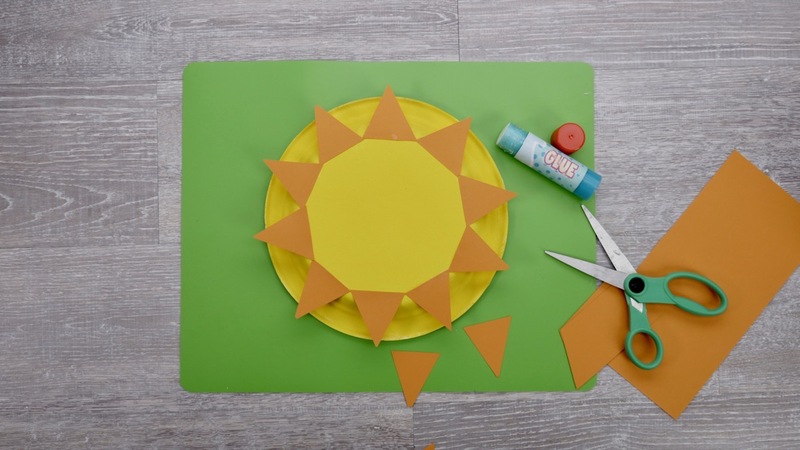 Cut out triangles from orange construction paper and make sure the tip length does not surpass the edge of your plate. 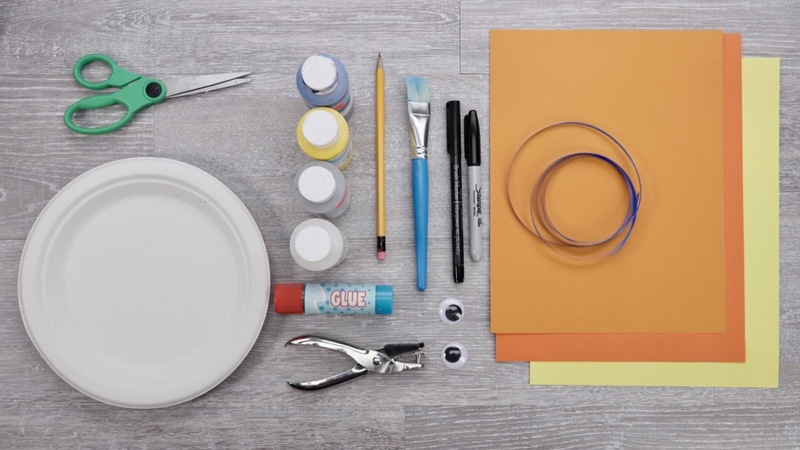 Glue the triangle shapes to the upper raised edge of your plate. 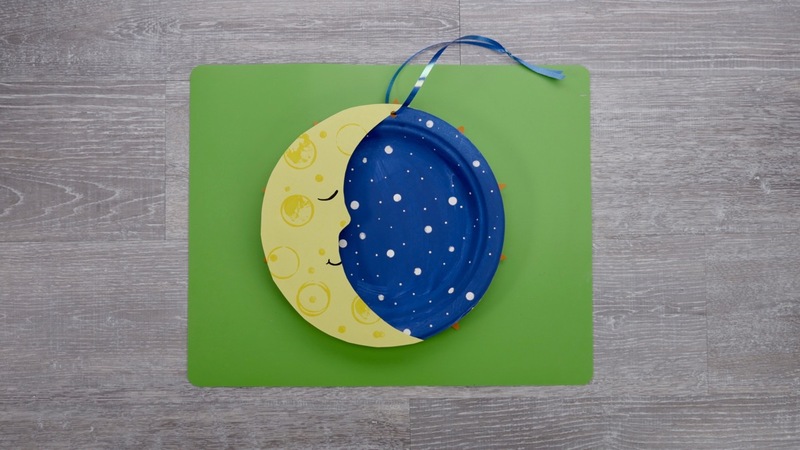 Punch a hole in the top center of your plate so that the moon is positioned where you would like it. Loop a ribbon through the hole and tie a knot at the end. Glue your sun’s eyes into place with the hanging point positioned at the centre top. Draw the sun’s mouth, nose and eyebrows. Hang on a wall for day and flip over at bed time!